This summer, Luminere is so excited to present the What's New Pussycat? campaign! Kitties, kitties, and more kitties!!! We love them!!! But did you know not all kitties have homes and worse yet, some don't even get a chance to have a home. All these little furry creatures want to do is give love and wouldn't that be a lovely addition to your home? In particular, Luminere is so thrilled to focus on those felines down at Chicago Animal Care and Control. Not just the ones in the adoption room because did you know that there's another room where there are many more kitties that just don't even get a chance to be seen, though nothing is wrong with them. There just isn't enough space in the designated adoption room. Worse yet, while you can see their pictures here: https://www.facebook.com/CaccCatsTransferTeam - you cannot foster or adopt them as there is just too much red tape. And to confound matters, the rescue groups that might be able to help you adopt them are also too overwhelmed much of the time to sponsor you. These kitties, then, are trapped and only a slow trickle make it to safety. The large majority are euthanized. 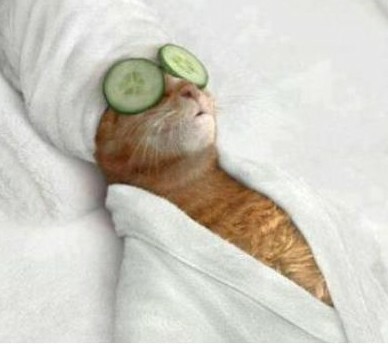 Furry Feline Facial: A 60 minute customized facial that will leave your skin purring. What's New Pussycat: A French or Brazilian wax.